Technology continues to make inroads in classrooms across the world at a dizzying pace. This makes complete sense as every learner in our classrooms at this point have known nothing but a digital world. In many cases, they’ve grown up with access to incredibly immersive technology practically since birth. As a result, it can be difficult at times to compete for attention using traditional teaching methods like whiteboards, worksheets, and extended direct instruction. When the experience is mostly passive relying on strategies that might have worked well in the past, it’s no surprise that classroom engagement learning to meaningful learning has been negatively impacted. In Learning Transformed, Tom Murray and I showcased some compelling data from Gallop that emphasizes this point. As I have written extensively in the past the digital world that we are now all apart of provides so much promise with paired with sound pedagogy. Instead of fighting the use of tech in the classroom and schools’ educators should not only embrace it embrace but look to expand their toolbox to better empower learners. With so many options to choose from it can be both exhilarating and frustrating at the same time. It seems that every day I’m introduced to a new tech tool that promises to change education. While the premise of many possesses potential, the challenge is to determine which tools are or will have a real impact on education. Research has shown that educational technology has the most effect on learners when it is part of an interactive experience, uses to explore and create as opposed to drill and kill, and consists of the right blend of teachers and technology. To improve outcomes student agency has to be at the forefront. I’ve always preferred tools that let students take control of their learning by turning passive consumers into creators because it allows them to tap into their imagination, while the learning happens naturally. I was blown away when I discovered Metaverse and seeing it utilized in a classroom during a recent coaching visit. It is a platform that makes it easy for anyone to create augmented reality experiences without having to code. I have not seen any other tools come close when it comes to ease of use and student engagement. So, what is augmented reality (AR)? Using the camera on a mobile device (phone, tablet) AR overlays images/media over the real world. It is a social experience, as opposed to virtual reality (VR) where a single student would wear goggles that would obstruct them from their surroundings. 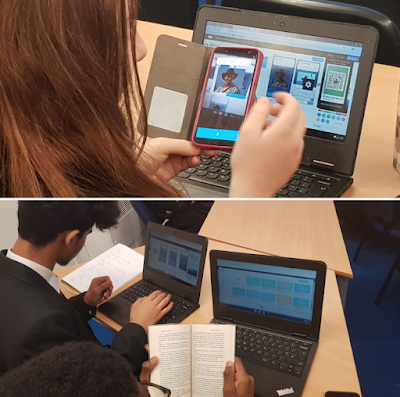 AR might have started out as a novelty but has now become a fantastic way to engage students through authentic learning experiences. There are many reasons to incorporate AR in the classroom. A short list includes letting students experience characters/imagery that would not otherwise be accessible (historical figures), new places (enhanced field trips), added interactivity to classroom materials, gamified learning, and more immersive opportunities aligned to the curriculum. As mentioned previously, I was first introduced to Metaverse during a coaching visit where students were creating AR projects for their peers to review ELA concepts. Since then it’s been fascinating to see Metaverse being embraced by educators in large numbers. What sets Metaverse apart from other AR tools is that anyone can create their own experiences quickly and easily. 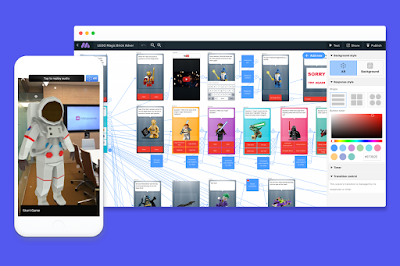 Metaverse consists of two components; Metaverse Studio where experiences are built in and the Metaverse app (iOS, Android and Chromebooks) where the can be subsequently viewed. Experiences are created by combining components on a storyboard (think digital Lego’s). Building your first AR Experience takes minutes. Here’s a quick tutorial. Metaverse is free for anyone to create and view AR Experiences (you can create as many as you like). 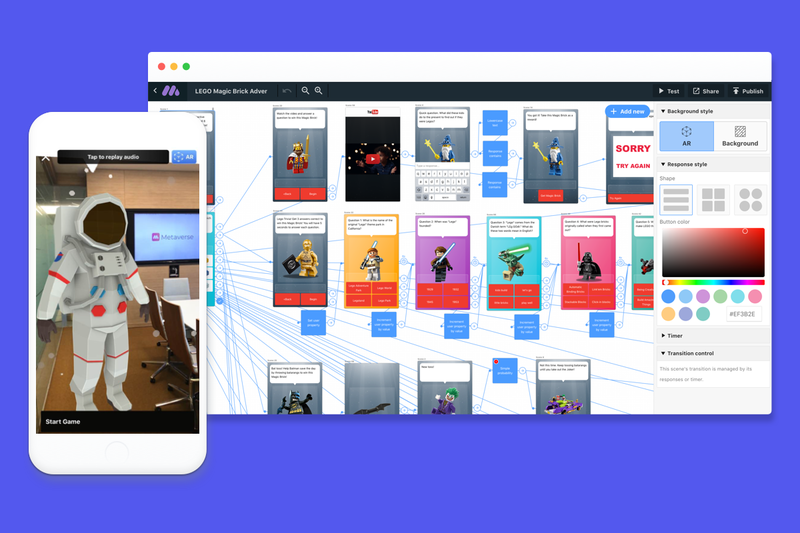 The collections feature is a premium addition to Metaverse Studio that is geared towards teachers who have students creating their own experiences. For more information check out the Metaverse blog to see what teachers are creating and check them out on Twitter. There are so many thoughts and ideas as to what learning really looks and feels like. From these conversations, educators form their own perspectives and opinions that best align with the vision, mission, and goals of their classroom, school or district. However, a consensus is critical if the goal is scalable change that results in improved learning outcomes. As I have written extensively in the past, research and evidence should play a significant role in what learning can and should be as well as whether or not it is actually taking place. Common vision, language, expectations, and look-fors go a long way to creating a vibrant learning culture. Recently I posted the following tweet. Are kids thinking at increasing levels of knowledge taxonomy? How are kids applying their thinking in relevant ways? 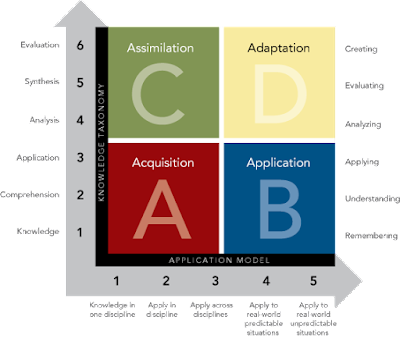 The Rigor Relevance Framework provides a practical way to determine the answers to both of these questions by looking at the level of questioning and the tasks that kids are engaged in. Consider it a litmus test of sorts. 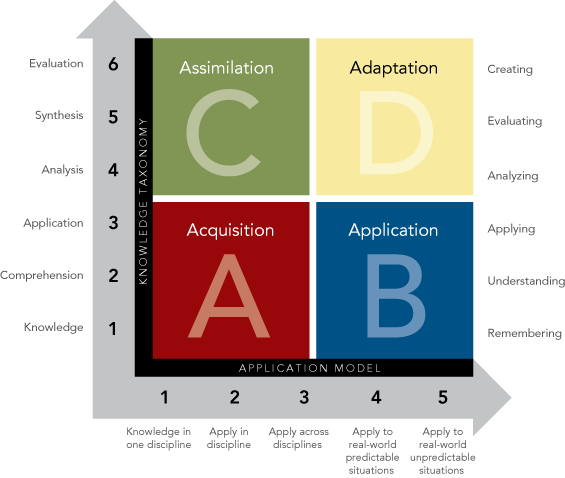 Where do the instruction (what the teacher does) and the learning (what the kid does) fall in terms of the four quads? Good instruction can, and should, lead to empowered learning, with movement along both the thinking and application continuums. The point here is to not reside in Quad D as that is a place you visit once and a while, but it should be an area that learners are moved to at some point during a unit of study. When technology is added to the mix, it should be utilized purposefully by the learner in ways that address the two questions posed above. The image above conveys a critical point. 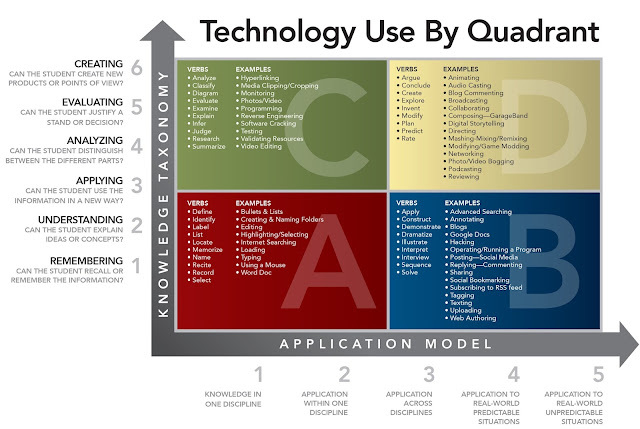 We should never look at technology as a distinct element separate from curriculum, instruction, and assessment. Each of these in their own right intersects in ways to support and enhance learning. It is essential to understand that the role of any digital tool or experience is to empower learners to think in ways that represent a fundamental improvement over traditional practice. The use of technology leads to yet another critical question – How are kids using technology to learn in ways that they couldn’t without it? All in all, learning has to be the focus. It’s up to you to determine if it is, in fact, taking place and if not what can be done to ensure that it is.